A few weeks ago I told you to go find and buy an old Mercedes C43 AMG, a hot little V8 rear-drive sedan from the 90s that still looks sweet and costs next to nothing today. A few days ago somebody took my advice. But maybe they took it a little too far. I’ve been following the LegitStreetCars YouTube channel ever since I discovered that its host Alex Palmeri shares my interests in really high-mileage cars and Mercedes-Benz AMGs. 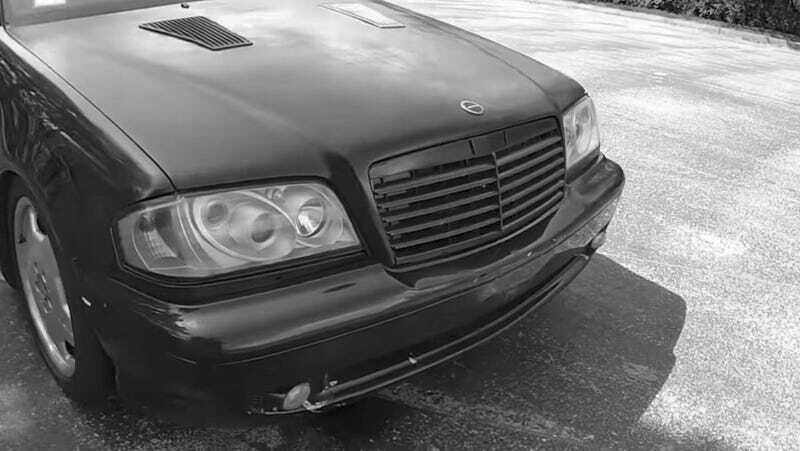 So when he claimed he’d scored one of my all-time favorites, a W202-chassis C43, for $200 I was skeptically intrigued. But dear lord, this has got to be one of the Worst Used Cars I’ve ever seen. Um. Where’s the rest of its intake piping? Besides the number of previous owners being in the double-digits and gross fast food refuse sitting in the door pockets, this thing has all the hallmarks of a car you want nothing to do with. There’s extensive substandard bodywork, mold all up in the carpeting, a nest of sketchy aftermarket wiring, garbage aftermarket parts strapped and stapled all over the thing, no hint of a service history... and did I mention screw-in cupholders that look like they were lifted out of a redneck pontoon party boat? For the purposes of making some entertaining YouTube content, this thing is ideal. For anything else, it’s just a rolling brick of headaches and heartache. I mean, it runs and drives and miraculously appears to be road-legal. But if you wanted a C43 to love and care for you’d be much better off buying a decent one for a few thousand bucks than starting with this rotten banana peel of a self-powered rolling shell. Shoot, this wouldn’t even be a decent rolling shell if it had no engine! It seems pretty clear that Palmeri knew he was buying a goofmobile and has no intention of restoring this sad, sorry tortured tuner car. And it is pretty cool that somewhere, some way, you can have an operational AMG V8 for the price of one of those oddly tiny TVs they sell at Rite-Aid. Even if the car looks like it’s one speed bump away from catastrophic self-immolation. But unless your plan is to hack it up and turn it into a giant go-cart or LeMons competitor, I’d advise you to stay away from scraping this deep into the bottom of the barrel when you can find the same car in great condition for a few thousand bucks.